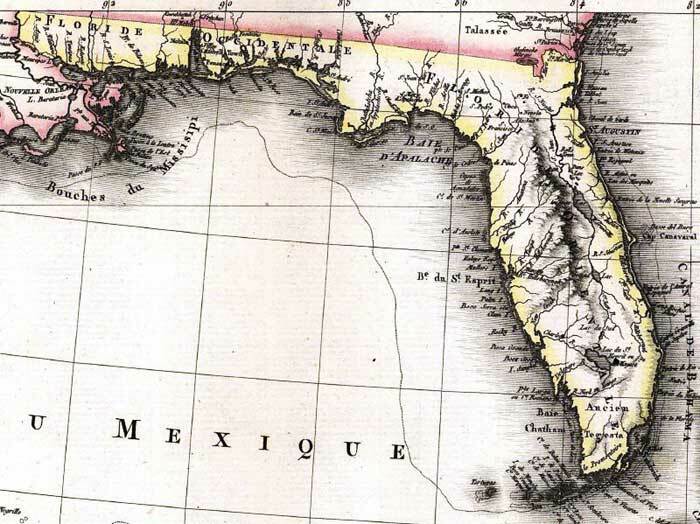 Description: A detail from the 1806 map of the West Indies showing the Spanish territories of Floride Occidentale, or West Florida, and Floride Oriental, or East Florida. This map shows coastal features, major lakes and rivers, and settlements. Relief is shown pictorially. Various place names reflect French, English, and Spanish variations, such as Cayo de Huesos for Key West, Baie Chatham for Ponce de Leon Bay, and Lac du St. Esprit or Lac de Mayaco for Lake Okeechobee.